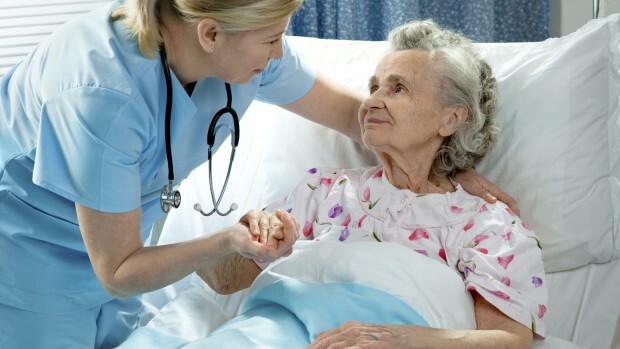 Patient transfer tasks occur across multiple healthcare settings and are often high risk activities for both caregivers and patients. Risk of patient and staff injury has led to the development of global Safe Patient Handling programmes. 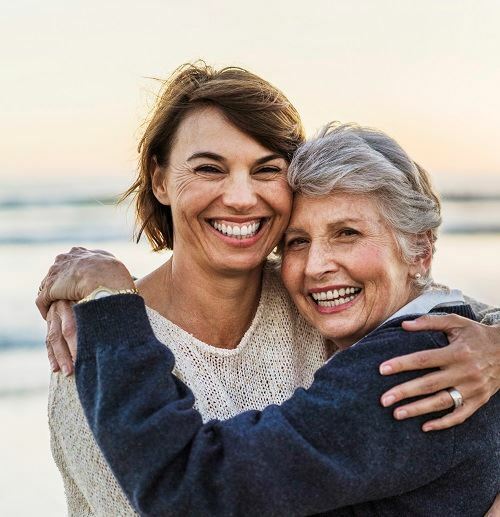 These programs promote the development of processes, education, identification of appropriate equipment and technologies to support safety of both caregivers and patients. An aspect of these programmes is the provision of medical devices such as patient transfer equipment to assist in the common transfer tasks. 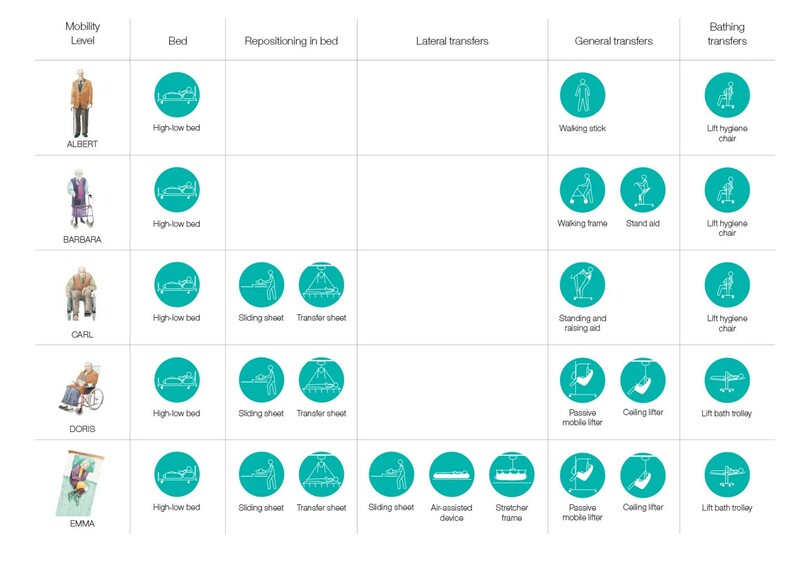 During these tasks different transfer devices are used depending on patient mobility. How do caregivers choose a transfer device? The patient’s level of mobility is key when choosing appropriate aids and planning for the right amount of space. As the patient’s mobility decreases, the number of aids and necessary space increases accordingly. Arjo has developed solution charts to indicate the correct aids for each level of dependency. Similar tools can be found in the CEN/ISO TR 12296(16)2 while, in the USA, equipment selection algorithms 3 are commonly used. In Europe, there are Clinical Practice Guidelines, which typically use a classification system of three or five mobility levels. The chart below shows the different transfer devices and its application to the functional mobility levels of the Mobility Gallery. For example, we can conclude that with Albert's mobility level there is little necessity to apply any transfer device. 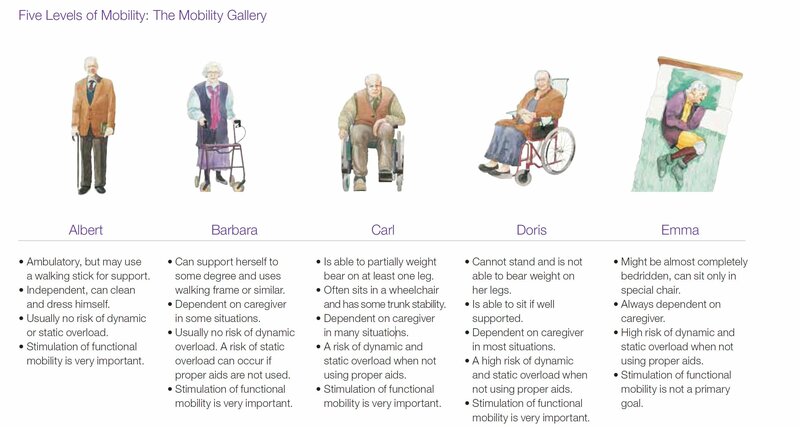 Furthermore, a patient with Barbara's mobility may require a: non-powered sit to stand aid while a patient with mobility level of a Carl most often requires a powered sit to stand aid also used for early mobilisation and rehabilitation. Patients in healthcare facilities with limited or no mobility such as a Doris or Emma will require a floor lifter or a ceiling lift. All Images from Arjo Guidebook, request a copy here.